January and citrus are a natural pair when it comes to me and cupcakes. As is typical, I ate too much chocolate and too many sweets over the holidays and really had to dig deep to find the motivation to even think of baking. But dig deep I did… Well, actually, I perused the latest issue of Imbibe (I will admit I have a recipe and photo featured in an article about cooking with tea) and stumbled on many a drink recipe that provided just the inspiration I needed. I settled quickly on bitters as a way to counteract my overindulgence in sweets. I love bitters. Likely because I love(d) to drink Manhattans. This combination came from a couple different drink recipes (both by Lance J. Mayhew of Meriwether’s in Portland, Oregon). 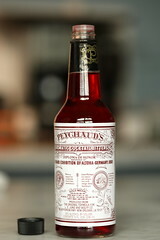 The bitterness and tartness of bitters and lemon appealed to my post-holiday’s sensibilities. I decided on a lemon chiffon cake to keep it light and meringue for the same reason. The end result is a pillow of sweet/bitter/tartness that is quite sophisticated (especially for a cupcake). This recipe likely won’t be for everyone and I will be interested to see how they go over at work tomorrow. I was pleased with the experience though. 2. In a medium bowl, combine oil, egg yolks, lemon juice, lemon extract, lemon rind, and bitters. Stir to combine. 3. On a low setting, start to beat the dry mixture and slowly add the wet. Increase the mixer speed to medium and beat until incorporated. 8. 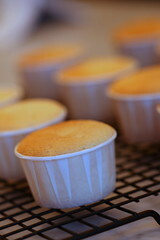 Scoop into cupcake cups about 2/3s full and bake at 350 F for 22-25 minutes or until a toothpick comes out clean. 3. Transfer to a small bowl. Stir in Sorrel and set aside to cool. 1. 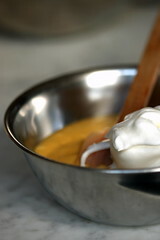 Whisk the egg whites and sugar over a water bath in the standing mixer bowl until it reaches a temperature of 110 degrees Fahrenheit. This only takes only a few of minutes. 3. With the mixer on medium speed, drizzle sorrel syrup into the mixer. Splash in a bit of bitters. Beat on high until stiff peaks form. 2. Toast with a culinary or blow torch. I’m definitely trying these. Awesome. I am intrigued by the addition of bitters! I wonder if it makes these the equivalent of drinks with bitters, which I often consider “sipping” drinks…maybe this is a tiny-bite-at-a-time cupcake? Those look really elegant. I am not a big lemon fan but sometimes a “lemon cake” is a great way to end a meal. I may make these for my sister. Thanks! Lemon cupcakes are my absolute favorite! You have just turned my favorite pie into a cupcake…I love you! Where in the world do you find time to bake, take care of your baby and work?! This is always the first thing that comes to mind when I read your blog. I’m a new mother as well, just returned to work a month ago, love to cook…but have a hard time juggling everything. Really…I just wanted to know how you time manage. Honest question, because I’m coming to a point where I feel a little desperate trying to to juggle everything at once. The combination of flavors is as stunning as the pictures! If my plate was not already full with projects,I’d run and make these just to try but I can see how bitters and lemon would work beautifully together! I have the same question. Work, baby, and cupcakes? How is it done?? Hmm.. interesting combination.. i’ll try them soon. Wow, these cupcakes look delicious. I might have to trade you Manhattans for cupcakes. Uh, Woa. These look amazing. I’m going to have to try these for Valentines Day. Ok, now I’m drooling. I’m so excited to try the meringue topping tonight. But, please can somebody tell me what sorrel is? I only know of it as a mild natural laxative. help! Thanks for your super quick answer. 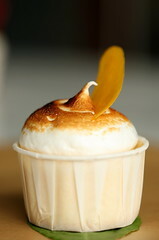 Can the meringue be made without the sorrel and bitters? I’m SO amateur, these probably sound like silly questions. Definitely… Just omit. There should be enough sugar to make it sweet enough with just the half cup. thank you so much. i’m going to give it a go tonight. Your blog is wonderful! I didn’t know that baking cupcakes have so much depth. Thanks! I was sucked into your exciting recipes. All of your recipes are very creative and I feel your enthusiasm. I’ve been looking for “lemon cupcake recipe” for my 5-year daughter’s birthday party. She insisted to share “lemon cupcakes” with her friends. So, I will omit the sorrel & bitters but I will check on your frosting recipes. I appreciate and thank you for sharing your creative works! What is the difference of using grape seed oil from vegetable oil in baking?